« Creamy Linguine with Prawns – another low-fat version! Another spaghetti dish but the full fat version this time – lot’s of double cream and cheese. This is a mysterious Italian dish from Jamie’s Italy which he claims is an old Italian recipe. We’ve looked in all of our Italian cookbooks and cannot find a reference to it anywhere. We even asked a real live Italian and he’d never heard of it either. So we’ll explain what it is – a super-indulgent chicken and mushroom pasta bake. We like it. Preheat the oven to 200°C/400°F/gas 6. Put the porcini mushrooms in a bowl and pour over just enough boiling water to cover (about 150ml). Set aside to soak for a few minutes. Heat a large saucepan, and pour in a splash of olive oil. Season the chicken with salt and pepper and brown gently in the oil. Strain the porcini, keeping the liquid, and add to the pan with the garlic and fresh mushrooms. Add the wine, with the strained porcini soaking water, and turn the heat down. Simmer gently until the chicken pieces are cooked through and the wine has reduced a little. Meanwhile, cook the spaghetti in plenty of boiling salted water according to the pack instructions, then drain well. Add the cream to the chicken, bring to the boil and then turn off the heat. Season well with salt and pepper. Add the drained spaghetti to the creamy chicken sauce and toss well. Add three-quarters of the Parmesan and all the basil and stir well. Transfer to an ovenproof baking dish, sprinkle with half of the remaining cheese and bake in the oven until brown, bubbling and crispy on the top (about 10-15 minutes). Serve with a drizzle of extra virgin olive oil and a sprinkle of cheese. Wine Suggestion: We cooked this dish to match an unusual wine that has been sitting in our rack for some time now. A Chardonnay and Savignin (not Sauvignon) blend from the Jura, in Eastern France. This wine has earthy flavours and is a slightly oxidised style – oxidation is normally what destroys wines when they’ve been open too long so this is a bit unusual. At 13 years old (vintage 1998) it showed beautifully with lovely yellow apple flavours and a fresh acidity. 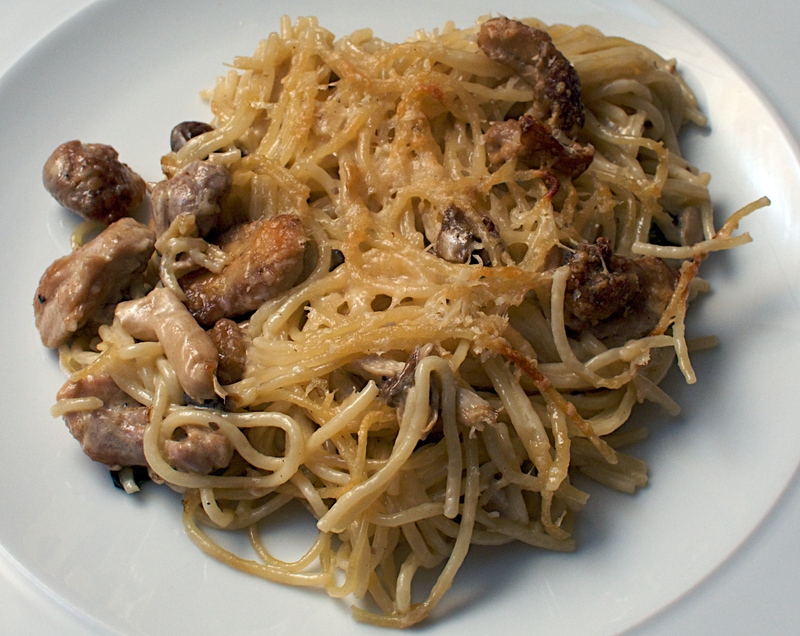 Still we loved it and it was a perfect match for this creamy chicken and mushrooms dish. If you can’t find a wine from the Jura we suggest a cool climate Chardonnay that has weight but maintained its acidity – a Pouilly-Fuisse or Meursault would be perfect. Yay, full fat 🙂 My mom used to make this. I had forgotten about this dish until I saw your post, must put it back on the menu. Also I remember my mother gave me the recipe which is stuck to the back of one of my old cook books. Maybe the Irish had something to do with this dish! now I know where Tetrazzini is from!!!! Mystery solved….